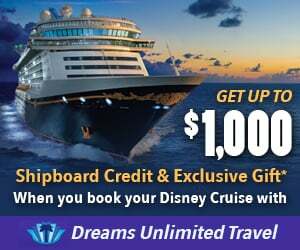 Discussion in 'Disney Cruise Line Forum' started by AuroraB, Sep 13, 2018. I'm getting conflicting information regarding how Disney's Transfers from MCO (with a pre-arrival stay at Hyatt Regency) will affect our boarding time. Here is the overall situation. Last week we booked a great VGT rate for the Sept 22 2018 Eastern Caribbean Cruise, I checked in online before figuring out flights, hotels and transfers and selected the earliest available PAT, 12:15-12:30. I added flights and transfers through Disney the next morning, and on my own a pre-arrival night at Hyatt Regency MCO. Now under "Port Arrival Time" in online check-in it says - "You have purchased transportation through Disney Cruise Line and are not required to select a port arrival time." but on my Port Arrival Form it says "12:15 PM - 12:30 PM". My goal is to get on the ship as early as possible, both to relax and let me oldest get some pool time before things get busy, but also to sign up for activities, and MOST importantly try to get moved to main dining. Since we booked late pretty much all the onboard activities are fully booked. Disney insists my PAT will be tied to when I arrive because I am taking their transfers, but from these forums I am worried that will not be the case, and I will end up standing around the port for 2 hours with restless kids. Others may have a different story, but when we did our cruise in June I found out the the PAT, when taking Disney transfers from MCO, is actually tied to when you finished your check-in on line. It had nothing to do with when we got on the Disney transfers or anything like that. Although we were on 2nd bus out of MCO, when we arrived, we actually had boarding group 9 which I thought was very unusually as our other friends on the bus had boarding group 2 (with the earlier PAT). When I asked about this, I was told that when taking Disney transfers from MCO, they tie your PAT time to when you actually fully finish your on-line check in. I'm notorious for not finishing everything right away (excursions and Palo, yes. Everything else, not so much). Hope that helps. It seems that is the consensus on here, but Disney reps are telling me it isn't true, which is a bit frustrating. I actually took a screen shot of my chat with them regarding it, but I doubt that would help anything! Curious, with group 9, how long did you wait to board? We sailed in August and stayed at the Hyatt the night before. My sister checked in online before she purchased transfers. I believe her PAT was 11:30 or 11:45. Her family was on one of the first buses out of MCO to Port Canaveral. They were in boarding group 14. I purchased transfers before I did online check-in so I wasn't able to select a PAT. We were on a bus to the port by 10:15. We were in boarding group 20. Another member of our family had a PAT of 11:45 and rented a car to the port. They checked in right around noon and had boarding group 13. It seems to be a disadvantage to take transfers and not be able to select a PAT. It was a long wait for our kids watching their cousins get in the line when their group was called. However, we were pixie dusted! A nice cast member had been watching us standing around waiting and let us in front of the line and onto the ship before our family in group 13!! Awesome way to begin the cruise. I'm not sure about the boarding group being tied to when you fully finish online check-in. I was online the moment our window opened and completed everything right away. We still ended up with group 20. Madzac and Shanti like this. It seems the key is to do your online check-in and complete it BEFORE purchasing transfers. We were jetlagged and finally got to the check-in area around 9:30 am. The line was out of control crazy, we finally got on the bus around 10:30, maybe even later! There was also a huge security line into the terminal. Once we made it inside, though, there was no line to check in and then we walked onto the ship. Just make sure you tell Disney that you are staying at the Hyatt and need your luggage transferred. Otherwise you will be doing it yourself! We've been told that using DCL transfers, you will get the "next available" boarding number when checking in. To explain: Each PAT window (11:00-11:15, etc) has X number of boarding numbers assigned to it. Let's say each window has 20 boarding numbers. Every time someone selects a PAT during the online check in process one of the one of the boarding numbers assigned to that window will disappear. Not all windows will get their numbers chosen. Now, at the port, a DCL bus arrives from MCO (no one with PATs), when those people start checking in, the available openings within the next PAT will be assigned. Sometimes that means the next available boarding number could be as low as a number that's currently boarding, or as high as the last ones available (if all others got chosen during the online check in). Yeah. I'm seeing that now. This was a last minute booking, so I guess a PAT of 12:15am isn't that horrible. Trying to figure out an overall strategy though as we are not registered for any onboard activities (checking several times a day) and I REALLY need to change to early dining. Is there pretty much no point of trying to get on the first bus? Thanks! They do know we are staying there, so that is all set. What time did you end up walking onto the ship? Not a clue. I have never stayed at the Hyatt - not a Hyatt girl. Now if only the Disney reps could explain it that way. That is the first thing that has made sense. I just mean, is there any point in trying to get on the first bus out of MCO in order to board the ship earlier? You may or may not be in the first boarding group, but boarding doesn't begin until around 11:15-11:30. Arriving via the first bus from MCO gets you there around 10:15 or so. You'll wait to board. I never had an issue getting an early Boarding Group on the first bus. But I also never booked the transfers until after I had done all my online check-in and selected the earliest possible PAT. Your chances of boarding a bit earlier by arriving earlier are fairly good. That said, Open Boarding typically begins around 12:30, so arriving at 12:15 you have a good chance you'll be boarding pretty directly as soon as you complete check in at the port. What time do they normally open up sign up for onboard activities, and changing dining times? I had heard this too but our experience was totally different. We were the last people off our bus and got stopped briefly with security. We checked in and had the very next boarding group (I think they were on 6 and we didn’t even walk away from the counter before 7 was called). Others on our bus had 14 and 20 and they definitely checked in before us. It was our last cruise before platinum so I don’t know if that helped, if it had something to do with online check in (I’ve heard that as well), or just some random decision. However it seems what they say they are doing is not in fact what is happening.